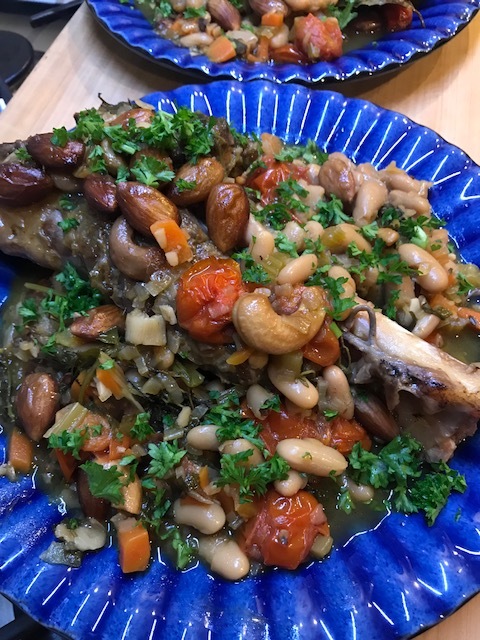 Last weekend I decided to buy lamb shanks from Karapiro Meats to slowly cook with plenty of vegetables from Areks stand and from Kylie of Fresh Gardens. 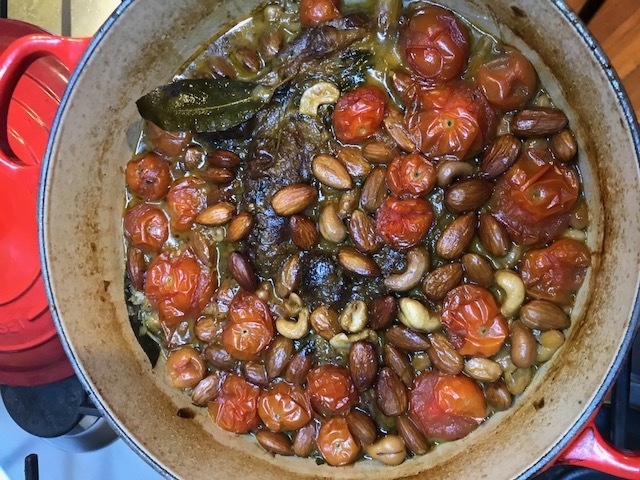 This is all quiet easy (as usual) but make sure you add the tinned anchovies as they definitely add a special depth of flavour which makes this dish different. Use a dish with a lid that can be used on the stove top and in the oven. Heat a little oil in the dish and brown the lamb shanks on a high heat. Remove the shanks and add the onions, shallots, celery and carrot. Soften them and then stir in the garlic. Add the white wine and gently simmer for 15 minutes with the lid on. Place the shanks back in the dish, nestling them into the softened vegetables. Also mix in the anchovies which need to be roughly broken up as they’re added. Also add the cannellini beans around the shanks. Add the herbs and stock. Then bake in the oven for 1.5 to 2 hours. Then place the cherry tomatoes and nuts on top of the shanks and vegetables. Cook for another 30 minutes. There is so much in this dish that you either don’t need anything else with it or just a have green vegetable with it.